On 19 th August 1906, Bishop Allen celebrated Solemn High Mass in the new St Patrick’s to mark the official opening. The Parish Priest at the time was Fr William Jones. 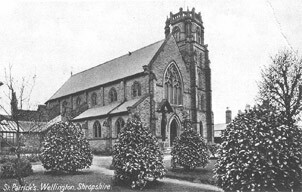 The total cost of the new church was recorded as 4500 of which £2000 had already been raised. The debt was finally cleared in 1944 and Bishop John Murphy subsequently consecrated the church on 17th June 1950 as a result. At the same time a new High Altar made of cream Derbyshire Stone was installed. Father Jones, by then 83 years old, attended the ceremony. In the 1970′s the church was re-ordered, partly to increase capacity to cope with around 800 weekly mass-goers and partly as a response to liturgical changes being introduced. The altar was moved forward to the centre of Sanctuary and the back wall was clad in oak panels. 2006 was the Centenary of the present church and the formal celebrations took place on July 8th with Centenary Mass celebrated by Bishop Brian Noble and 20 priests in the presence of 2 Mayors, our MP’s representative, the Heads of our two Catholic schools, 10 guest Ministers from local Christian churches and, of course, a church full of parishioners.